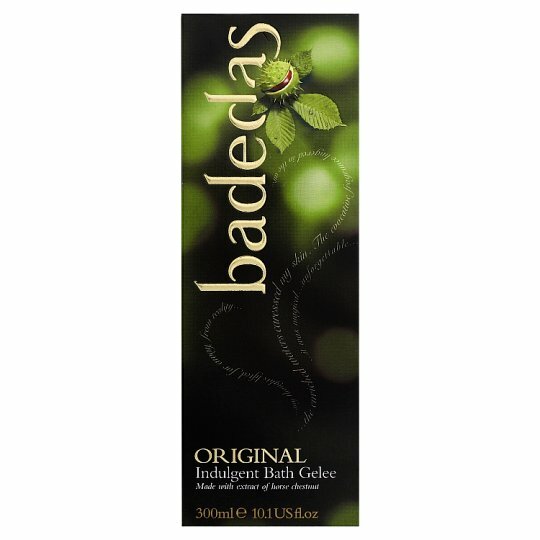 Badedas is a unique range of premium bath and shower products containing horse chestnut, that enriches Badedas with its distinctive fragrance. Badedas products are created with natural plant extracts for a truly luxurious bathing experience. The Badedas range consists of three products including shower and bath products one being Indulgent Bath Gelee 750ml, the second being Original Bath Gelee 300ml and the third being Revitalising 3 in 1 Shower gel 200ml. Choose to use one of our Badedas range and use our indulgent bath products and experience the intensity of Badedas Indulgent Bath Gelee. A rich bath gel with a concentrated formulation, with the distinctive Badedas fragrance and natural moisturisers to leave your skin feeling soft, delicately fragranced and leaves you feeling completely indulged. When using our Badedas Bath product for best results pour the bath gel under warm running water and step in then surround yourself with an abundance of bubbles. Slide down into the fragrant waters that is enriched with natural plant extracts including extract of horse chestnut. Step out of your world and immerse yourself with Badedas. When using Badedas bath gel avoid contact with the eyes and if this happens, rinse well with clean, cool water. For adult use only.